Please tell me what you would do! Thread: Please tell me what you would do! 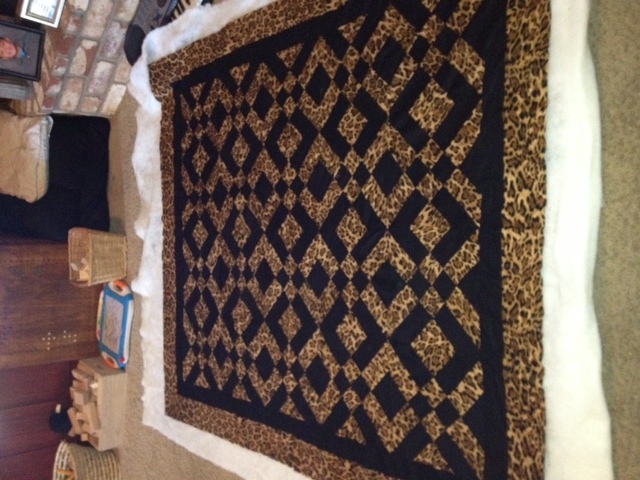 Need to start quilting! This leopard fabric is soooooo stretchy - and besides that I can just do really easy stuff! What would you do????? I would buy other fabric. This doesn't seem suited for quilting. Most quilter's use 100 percent cotton with a tight weave. Don't set yourself up for heartbreak. Especially if you are new to quilting. But it you must quilt it. Starch it very stiff and this will help. Don't stretch it out of shape while you are ironing it. That would be a big mess after washing. Have you any old colored sheets or clothing, or anyway to get better fabric? Start by cutting 2 or 3 or 4 inch squares and get started just sewing into 4patches or 9 patches. Before you know it you will have a pretty good start. Do you have a place to get good cotton fabric? Last edited by barny; 08-01-2013 at 08:53 AM. Sorry ~ couldn't get it to add to original post! If you're going to do simple all-over quilting, could you turn it upside down and quilt it? In other words, quilt with the back-side up? Glue the batting to the back and top so it won't stretch. Elmer's Washable School glue spread very thin with a paint brush will hold it in place perfectly. I have done this and it's ready to start on. Thanks ~ love Elmer's glue. How would you quilt this? Straight lines, some kind of curved lines (easy)?????? Everything that I have read says that all of those squares should have some rounded quilting in them????? The back is out of the same two fabrics...........in about 100 pieces! Great idea......but I have used the same two fabrics on the back! it is a very pretty quilt! You could just do an all over meander. Or a flower meander all over the quilt. That will bring in lost of curves. Quilt it how ever it's going to be easier for you! When you say 'stretchy' is it minky fabric? It's really an eye catching quilt! With all the movement on the quilt, I think the quilting design will probably get lost in it! Well, I'm sorry I took your post wrong. I thought you were just beginning to SEW! Wow, that is a pretty quilt. Forgive me? I sure hope so. Looks so pretty. Barny Maybe I'll learn to read things better. Last edited by barny; 08-01-2013 at 11:59 AM. Beautiful quilt! Think I would go with the Elmer's glue suggestion. Haven't tried it yet but yours seems a likely candidate. I'd be sure to use a walking foot, unless you are free motion quilting. That will help ease the fabric along. I also did not realize it was a top that was done - which is very attractive. I think I would do stitch in the ditch. Then, if you feel compelled to do more, you could do some stuff on the black fabric. Are you wanting the diamond shapes to stand out? Maybe a echoing of those. It is funny when you want your quilt to talk to you - and tell you what quilting would make it "more" attractive....lol. Great quilt, good luck. and Barny~no problems! I didn't word the question very well, and then the pic didn't post, and then......well you get the picture of the way my day was going!!!!!! It's your quilt do it your way. you might try auditioning with a scrap used in a block and stencil on it, then lay it in one of the areas and stand back. Try a few different ones and see which you like best. I think I would start in the middle and make a straight line from the center out in all four directions. That would divide the quilt into quarters and and provide anchor. Then depending on what you kind of quilting you have chosen go from there. For example if free motion, work on one quarter at a time or if stitch in the ditch continue to work from center out. I think you should be fine since you glued it. Spray baste the batting to the backing, then spray baste the top to the batting. I would do a simple design...just a meander, clamshell, or other quick design. Never use it if it is very stretchy. if you just have to use it back it with a light weight stabilizer such as pellon.